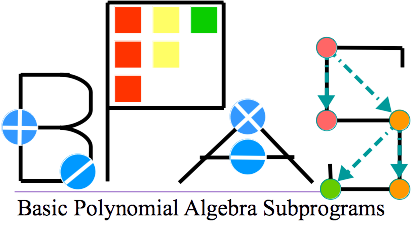 The Basic Polynomial Algebra Subprograms (BPAS) library provides support for arithmetic operations with polynomials on modern computer architectures, in particular hardware accelerators. Typical operations are polynomial multiplication, multi-point evaluation and interpolation, real root isolation for both univariate and multivariate systems. Its code is written in C++ with CilkPlus extension targeting multi-core processors. Polynomial multiplication and matrix multiplication are at the core of many algorithms in symbolic computation. Algebraic complexity is often estimated in terms of multiplication time. At the software level, this reduction to multiplication is also common (Magma, NTL, FLINT, ...). BPAS design follows the principle reducing everything to multiplication. Polymorphic integration code features exact integration (as a formal sum) and symbolic-numeric integration of both dense and sparse representations of rational functions. If you have questions or bug reports, please contact bpas <at> scl <dot> csd <dot> uwo <dot> ca. 2019-02-11: Polyhedral Sets and Fourier-Motzkin elimination. 2018-10-18: RegularChain and TriangularSet for polynomial system solving. 2018-10-18: Optimized sparse multivariate polynomials over the integers (SMZP). 2018-05-07: Class hierarchy restructuring. Finite fields. High-performace sparse polynomial arithmetic and data structures in SMQP. 2016-03-18: Symbolic-numeric integration of rational functions as well as a symbolic-numeric brute-force partial fraction decomposition method are incorporated into BPAS library using MPSolve for numerical rootfinding. 2015-08-23: Truncated Fourier transform is implemented as a low-level function. 2015-04-13: Sparse univariate polynomial supports for resultant and subresultant chains operations. 2015-04-13: GCD and Square Free operations are supported for BPAS univariate polynomials. 2014-08-14: BPAS has contributed to Symbolic Integration, thanks to Robert Moir (U. Western Ontario). 2014-04-28: BPAS moved from 32-bit to 64-bit arithmetic. 2013-11-27: First release was online.